N° 20 Portman Square is acknowledged as Robert Adam’s finest surviving London town house. The interior is conceived as a series of grand reception rooms, beginning with a typically austere hall, leading to one of the most breathtaking “tour de forces” in European architecture; Adam’s Imperial staircase, which rises through the entire height of the house to a glass dome, revealing the sky above. 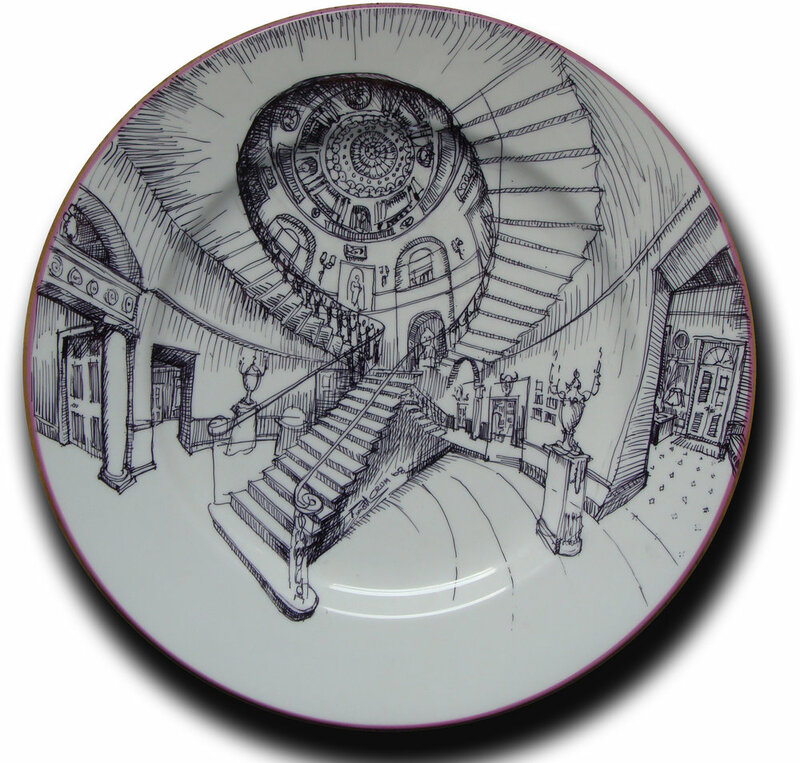 The plates below were created for a local charity, featuring a sketch of Robert Adam's stair by Timothy Crum. Proceeds from this concert will be going to the Windmill Trust. The Windmill Trust enabled the restoration of largest post mill in the country, The Windmill in Sussex. More information on this project here. Design progress sketches for a new "Oyster Bar"
The planning committee at Westminster council said it was favour 'in principle' of installing a memorial to Margaret Thatcher, but it rejected plans saying her representation in House of Lords robes did not reflect her achievement of becoming the UK's first female prime minister. Town hall chiefs insisted she be depicted carrying a handbag. Libero Baby Products have shot their new commercial at one of FINE architecture's projects. Beatrice receiving the award from the Lord Lieutenant of East Sussex for her outstanding work on the restoration of the Windmill! Congratulations Beatrice! FINE architecture wishes everyone a happy holiday season! Beatrice Frost is to receive the award of British Empire Medal (BEM) in the 2017 Queen's Birthday Honours List is for services to UK National Heritage for her outstanding work in the restoration of The Windmill in East Sussex. 2017 is a special year, as it marks 100 years of the Order of the British Empire.